Notes: Situated within a park in Clitheroe town centre it is reasonably well sign-posted. Onroad parking available as well as town car parks nearby. The remains of a small Keep, built mainly for accommodation rather than defence, set atop of a Norman motte. A small museum is directly adjacent to the castle. Owned and operated by Lancashire County Council. 1. The honour of Clitheroe, including what was left of the castle, was granted to General George Monck by a grateful Charles II in 1661. An enclosure castle built to guard the River Ribble, Clitheroe Castle served as an administrative centre and prison. It saw belated action during the Civil War when occupied by members of the Lancashire militia and was then slighted on the orders of Parliament. Clitheroe was built no later than 1102 atop of a steep limestone rock which rises about the River Ribble. It is an example of an enclosure castle - a defended stronghold where the outer walls were the primary defensive structures rather than relying on a Great Keep as a last resort refuge. 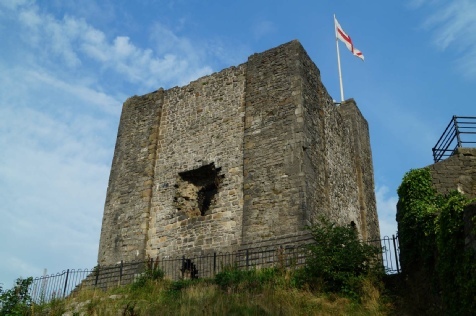 Although Clitheroe does have a Keep it was built for accommodation purposes and was relatively small; any attacker who surmounted the motte and breached the walls would not have had difficulty accessing the Keep. The curtain wall extended North, East and West around the Keep and to the South wrapped around the bailey. Clitheroe was the seat of the Honour of Clitheroe and, paired with Pontefract, was owned by the de Lacy family who used it as their administrative centre functioning as a court and prison. In 1311 it passed by marriage into the hands of Thomas, Earl of Lancaster and was subsequently consumed into the Duchy of Lancaster. In 1327 it was acquired by Queen Isabella, wife of Edward II. During this period various repairs were carried out to buildings within the castle and a new gatehouse was constructed. By the Civil War the castle was ruinous but was nevertheless occupied by a Royalist force who made a few makeshift repairs. No action is recorded there during the war itself but in 1649, following the execution of Charles I, it was briefly reoccupied by members of the Lancashire militia who refused to disband. Once dispersed Parliament gave orders to compromise the defences to prevent it being held again and resulted in the large breach made in the Keep.